TAO Group is a leading restaurant and nightlife company that develops, owns and operates many of the most successful food, beverage and nightlife entertainment venues in the United States. Their new corporate website features a venue search for users seeking to find more information about their venues, responsive design, and a content management system. The TAO Group site also features profiles for each venue, which contain location and contact information, menus, reservations widget, social feed, and mailing list sign up. 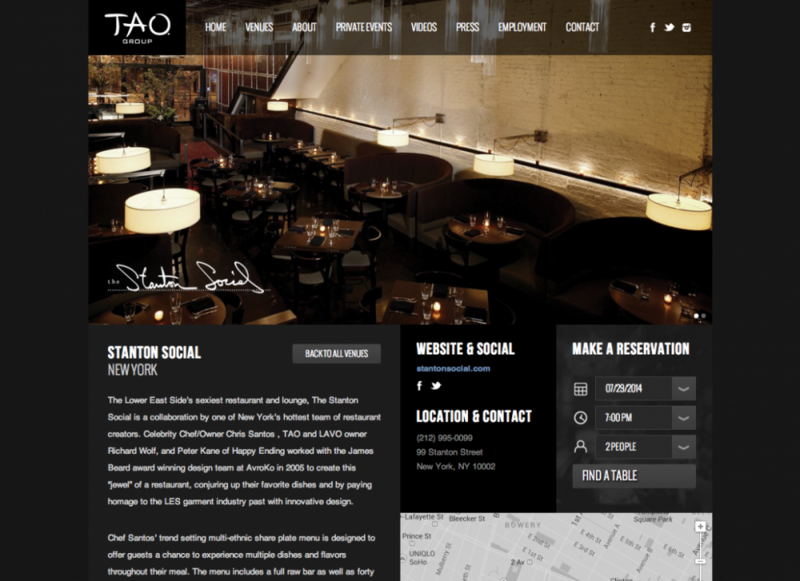 The TAO Group site is the perfect way to discover and learn about TAO’s various venues – you can view their menus, follow them on social media channels, or even book a private event on their individual venue pages. The venue search page makes it easy to for visitors to discover venues by filtering via city, type of venue, and even cuisine.